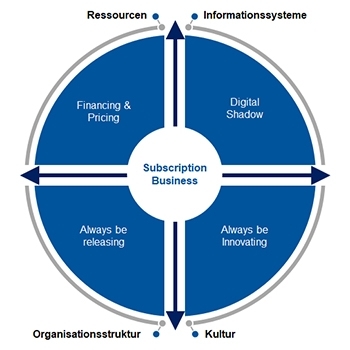 How should subscription business models and their management be structured in mechanical and plant engineering? How can subscription business models contribute to increasing customer value, continuous optimization and continuous innovation of service offerings? The Subscription Business Management Division is working on answering these and other questions. The group's focus is on the premise that companies achieve a revolutionary competitive advantage by transforming themselves from classic product and service providers to providers of subscription business models. New business models enable companies to convert the technical possibilities of Industry 4.0 into economic success. The basic principle of a subscription business is to offer the customer access to a constantly improving service in return for regular payments instead of a one-off sale of products or services. Subscription business models consistently focus on customer benefit. They are particularly effective if the customer is not only granted access to a service, for example the availability of a machine, but the provider also achieves a permanent increase in performance. In order to realise such an offer, it is first necessary to record customer behaviour in data form. This is only possible through the implementation of an appropriate technical infrastructure and the networking of existing physical products. The aim is to create a digital shadow through the Internet of Production, which will enable a unique customer understanding (Customer Insights) to be built up. In order to permanently transform the acquired knowledge into an innovation and improvement of performance, a culture of continuous learning and improvement is required in the company. This culture, combined with organizational framework conditions, enables effective and efficient implementation of high-frequency updates and further development of the service offering. In addition to the technical challenges, an organizational transformation must also be carried out. Companies that offer subscription business models must be in a position to permanently transform the knowledge about customer behaviour into an innovation of their performance. In contrast to today's thinking in product generations and completed development projects, subscription companies are in a permanent state of performance improvement. Due to the high digital share of value creation directly at the customer, these improvements can be translated back into releases at the customer much faster. Such an approach, which is now common in the software sector, namely to extensively adapt or expand the scope of services after the market launch, is still viewed very skeptically by many in mechanical and plant engineering today. In addition to the innovation process, other areas of the company are involved, such as sales and marketing. Virtually all areas of the company are now oriented towards product- and service-oriented thinking and must be adapted accordingly to a subscription business model. It is also necessary to reassess a company's financial resources when offering subscription business models. Financial processes must capture the dynamic, ongoing revenue relationships that form the foundation of the business model.